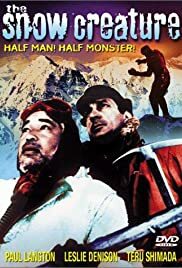 American botanical expedition in the Himalayas stumbles across a Yeti den, capture one and transport it back to Los Angeles, where it escapes while customs officials are debating whether it is animal or human. A very large, degenerate, Spanish conqueror is freed from suspended animation by lightning and goes on a killing spree in a small town. Sherlock Holmes and Doctor Watson travel to Washington D.C. in order to prevent a secret document from falling into enemy hands. Sherlock Holmes investigates a series of deaths at a castle with each foretold by the delivery of orange pips to the victims. George Douglas ... Corey Jr. The Snow Creature, half man, half monster. The snow creature monster's costume is a bad attempt to make him look scary and half monster. All it really does is make it look like a man going out trick or treating on Halloween. I think most of the acting was ok. It had a couple of small twists that were unexpected and I think that the second half of the movie outdid the beginning. I rated this movie a 5 but it barely made that 5. If I could, I would have called it a 4+. I bought this dvd expecting it to be a bad movie and was surprised to find that it was actually better than expected. I thought it was going to be worse. While looking back at the whole movie, I must say that I liked it.